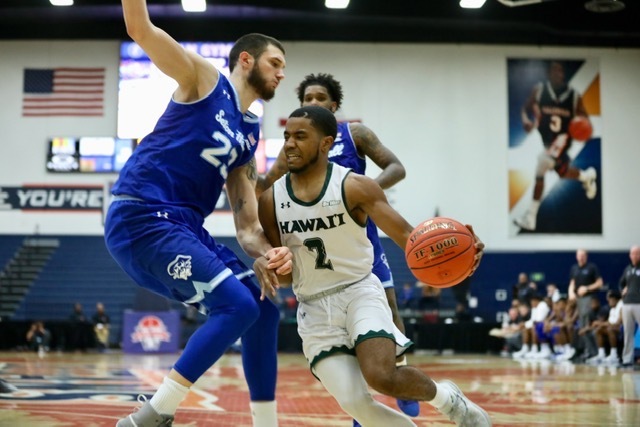 FULLERTON, Calif. — In this land of thrilling roller coaster rides, the University of Hawai’i men’s basketball team reached new heights Thursday only to suffer through a sharp dip barely 24 hours later, falling to Seton Hall, 64-54, in the John Wooden Legacy semifinals. 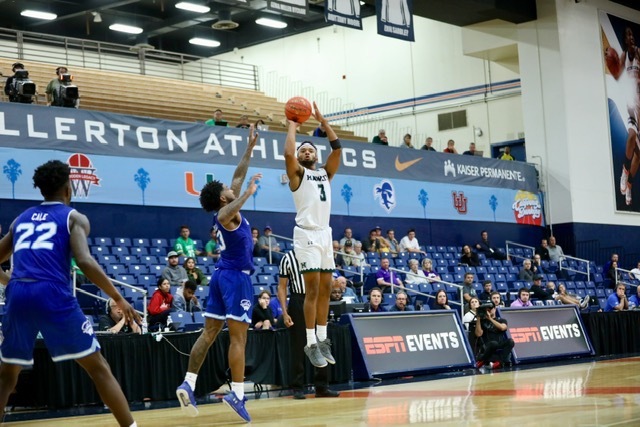 Myles Powell scored a game-high 19 points and Mike Nzei added 16 points and grabbed six rebounds to help Seton Hall surge past the Warriors and improve to 3-2 going into Sunday’s championship game vs. Miami (Fla.). A sparse late night crowd of about 500 at Cal State Fullerton’s Titan Gym and a national ESPN2 TV audience watched Sheriff Drammeh and Eddie Stansberry each score 14 points to lead UH, which fell to 4-2 and will play Fresno State (2-2) for third place at 11 a.m. (Hawai’i time) Sunday, in a game that will be shown on ESPNU. Seton Hall will play Miami (Fla.) for the championship at 5:30 p.m. on ESPN2. Seton Hall led 25-23 at halftime and after Drammeh’s high-arching 3-pointer from the left wing swished through the basket to put the Warriors up, 34-31, just over five minutes into the second half, Anthony Nelson answered with a driving layup to ignite a 12-0 run capped by Sandro Mamukelashvili’s free throws that put the Pirates ahead for good, 43-34, with 10:36 remaining. Drew Buggs finally snapped the string with a layup off a baseline drive 30 seconds later to start a 10-4 surge capped by Stansberry’s 3-pointer from beyond the top of the key to close it to 47-44 with 6:30 left, but the 6-foot-10 Mamukelashvili drained a 3-pointer from the left wing at the 6:05 mark to ignite a 13-2 run capped by Jared Rhoden’s putback which made it 60-46 with 2:28 remaining. Stansberry responded with a 3-pointer from the right corner 18 seconds later to cut it to 60-49, but UH could not get any closer the rest of the way. 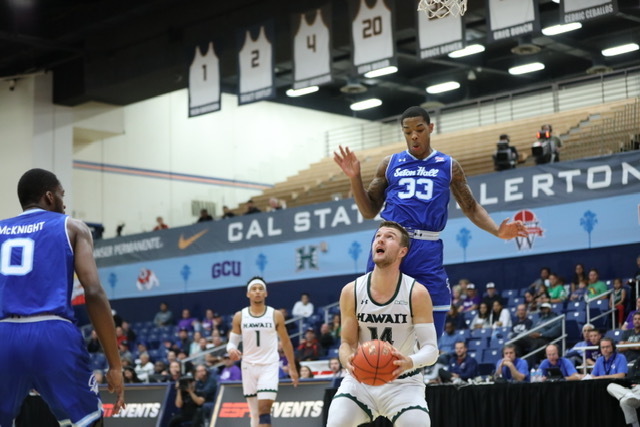 Hawai’i started the game strong, with Jack Purchase draining a 3-pointer from beyond the top of the key and then sneaking in for a reverse layup off an inbounds pass for a quick 5-0 lead with 17:38 remaining in the half. But Seton Hall came back strong with an 9-2 run ignited by Myles Cale’s 3-pointer from the left wing and capped by Taurean Thompson’s layup to give the Pirates their first lead at 9-7 with 13:32 left. The teams then slugged it out toe-to-toe for the rest of the half, with neither going up by more than a basket until Powell buried a 3-pointer from the left wing to put Seton Hall ahead, 25-21, with 2:37 remaining. But Drammeh swished a nifty floater from the left side with 1:02 left to close it to 25-23, and that’s how it stood at halftime. “I thought both teams played extremely hard, and brought great energy defensively,” Seton Hall coach Kevin Willard said. “I think both teams were a little sluggish to start offensively … But I thought once the game got going both teams settled in and played hard. The game stayed tight for the first five minutes of the second half, but the Warriors’ offense appeared to stall a bit after Drammeh’s 3-pointer gave them the 34-31 lead with 14:51 remaining. 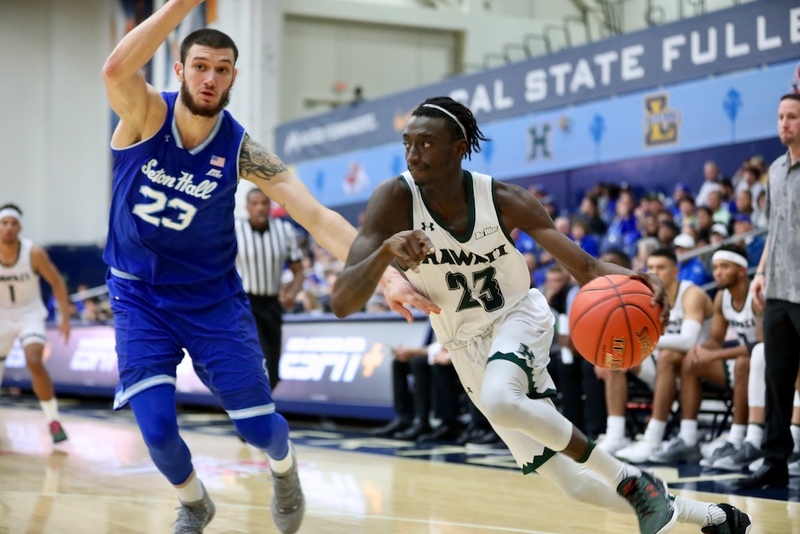 Ganot acknowledged part of that could be traced to three-quarter court pressure thrown at UH off-and-on throughout the game. Willard said he went with the three-quarter court pressure in an effort to slow down Warriors guards Brocke Stepteau — who scored a career-high 24 points in Thursday’s 90-79 upset of Utah — and Buggs, who finished with 10 points and five assists Thursday. “I was really impressed with how Buggs played (Thursday), and Stepteau,” Willard said. “I thought they were so effective in the pick-and-roll, and I just didn’t think we could just sit there and play man-to-man the whole game and expect to defend those two guys. “Stepteau, he’s really improved, we played him a couple years ago (in the Pearl Harbor Classic), and I told him after the game it’s a dramatic difference from how he was two years ago to now. Ganot said despite the disappointing loss, he wants the Warriors to embrace the opportunity to play Fresno State for third place Sunday. “The perspective part of it is, this is what you live for — not what you signed up for, but what you live for,” Ganot said. “This is great — how fortunate are we … Yeah we lost, and I want our guys to take the hit from that, but we get to play again, in a great event, a first-class event, against a great team. Fifth place: Northwestern vs. Utah, 9:00 a.m.
Third place: Fresno State vs. Hawai’i, 11:00 a.m. 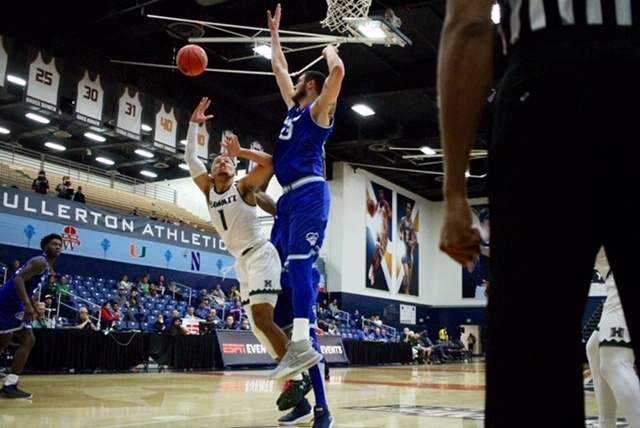 Seventh place: La Salle vs. Grand Canyon, 3:00 p.m.
Championship: Miami vs. Seton Hall, 5:30 p.m.
Where: Titan Gym – Fullerton, Calif.
Seton Hall better than Utah, now Fresno St. much much better that Seton Hall. especially defensively. That seems to be the key throughout the recent years. Those teams with excellent pressure defense, or mix up the matchups, pressure, drop back., disrupt UH from running their very disciplined offensive sets, inside out to shooters for 3, or pick and pop, or pick and roll,, North Texas, Seton Hall, Fresno St will do the same. If UH could run, go deep, quicken pace, before Fresno gets setup , get some quick hitters or easy fastbreak buckets, UH can stay with, if not beat Fresno soundly. However appears, UH and Eran teams are not designed that way. Good these next 2 games prepare UH for road in Big West Conference, I don’t think those teams play as great defense,? I hope the best, hey I take any win, by any UH team, however they come ! Go Warriors Bows. Just my thought. Thanks for the video and report. 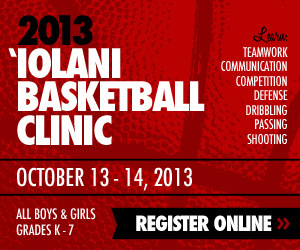 Good info on the 3/4 court press by Seton Hall.